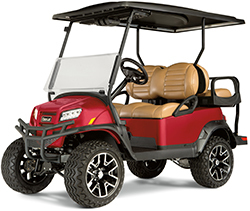 Golf carts are a must-have piece of gear that can help you navigate the golf course and get to the next hole with ease. But what if you want to take your cart off the course? More and more people are utilizing the power and versatility that golf carts offer to get them from point A to point B. Most carts don’t require gas, are much quieter than a standard vehicle, and have a small footprint that makes traveling a cinch. With that being said, you can’t just hit the streets without a bit of extra preparation. There are strict federal and state guidelines in place that help to keep all drivers safe. Any vehicle that drives on a public road must meet certain criteria to be deemed legal. Failure to make your golf cart legal can lead to some steep fines. Luckily, transforming your golf cart into a street legal vehicle isn’t difficult. Can All Golf Carts Be Street Legal? In most cases, any golf cart can be turned into a legal slow-moving vehicle as long as they meet certain requirements. One of the most important requirements is their speed. Golf carts have to be able to reach a minimum speed of 20 miles per hour and a maximum of 25 miles per hour. They’re classified as slow-moving vehicles, so you won’t be able to weave through traffic on the freeway. In fact, slow-moving vehicles of this type are restricted only to roads that have a speed limit of 25 miles per hour or less. If your golf cart isn’t capable of reaching those speeds, you’ll have to modify the engine to get more power. Another requirement is that it needs to run entirely on electricity. According to federal law, all low-speed vehicles have to be electric. No gas-powered golf carts are permitted. So What Do I Need to Make My Golf Cart Street Legal? 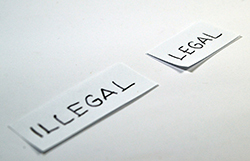 If your cart meets the previous basic requirements, you’re well on your way to getting a legal status. However, there’s a lot more to do. While they may have a maximum speed of merely 25 miles per hour, that’s still fast enough to do some damage. You have to make sure that your cart has all the safety features of standard cars. This is to keep yourself, passengers, and other drivers on the road safe. Other drivers have to be able to see you as you drive. They also need to be able to anticipate your actions. To make yourself seen, you’re going to need to outfit your cart with a bevy of different lights. 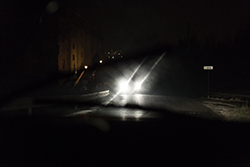 They’ll help improve your visibility during the day and at night. You wouldn’t drive a car at night without lights, so why take that risk with a golf cart? You’ll need headlights, tail lights, turn signals, and brake lights. If your cart doesn’t come with these lights built in, don’t fret. There are many “street legal golf cart kits” on the market. You can easily find a package that’s suited to your cart’s particular make and model. Many of these kits also come with a horn for good measure. When installed correctly, they’ll look like they were installed at the factory. You can find a kit for your cart here on Amazon. There are a number of additions to ensure your own personal safety on the road. Many of these items can also be purchased to fit your cart perfectly and provide a seamless look. These include mirrors, windshields, and seatbelts. Mirrors are essential for seeing behind and around the cart. Like with standard vehicles, these mirrors should be positioned to give you an unobstructed view at a glance. You can invest in a center rearview mirror as well as side mirrors. Depending on where you live and plan to drive, local laws may dictate which types of mirrors you need to make your cart street legal. A windshield will keep bugs, rain, and dirt out of your face. They’ll also provide a safety barrier that can prevent injury during an accident. They’re required by law. Golf cart windshields are typically made of strong acrylic that’s shatter resistant. Again, the exact parameters you need depend on your municipality. If you want even more protection, you can also get windshield wipers. Finally, you need seat belts. Every seat on your golf cart needs to be equipped with a seat belt if you want to take it on the road. Golf carts are more open and exposed than traditional automobiles. That extra restraint will prove to be beneficial if you ever go around a sharp curve. They’ll keep you contained and safe. If you’re on a public street, your cart needs to be insured. Much like standard vehicles, it’s federal law. You can’t legally be on the road without insurance that provides adequate coverage. Most automobile insurance companies can provide you with coverage as long as you have the appropriate information and legal status. While the minimum age to drive a golf cart on private property is as low as 14 in some states, that age requirement goes up when you hit the public street. To drive them legally, you must be at least 21 years old. All vehicles on the road must be registered with the appropriate governing bodies. To be legal, your golf cart must have a VIN. The VIN, or vehicle identification number, is used by the government to identify the cart and its owner. You can acquire a VIN during the registration process. It then must be properly displayed on the cart. 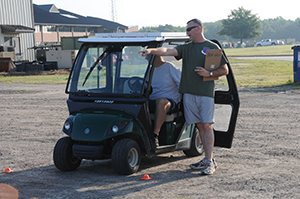 In addition to registration, the cart must be inspected for safety on a yearly basis. Not only do you need to meet the age requirements to drive a golf cart on the road but you also have to hold a valid state driver’s license. This ensures that you know and follow all applicable rules of the road. Carts also have to have a license plate tag for easy identification. Other drivers that are moving at higher speeds may not immediately notice that you’re in a slow-moving vehicle. This is why many municipalities require a slow-moving vehicle sign. All of these changes are basic federal requirements that will help you make your cart street legal. However, certain requirements differ from area to area. Some states and local municipalities have stricter requirements on certain components. 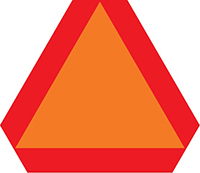 For example, some local laws may call for a DOT-rated windshield, certain tire heights, and mirrors. Check with your local laws to make sure that your cart meets their specific guidelines before you are pulled over and issued a ticket. All in all, it’s not hard to transform your golf cart into a legal slow-moving vehicle. Golf carts already have the basics. All they need are a few extras that add to the driving experience and keep everyone safe.